Jeremy Renner is good at keeping secrets. Earlier this week, it was revealed that Disney+ and Marvel Studios are developing a Hawkeye series, starring Renner. However, when asked about the subject, the actor plays coy and changes the subject back to a running joke. Renner is currently out with the rest of the Avengers: Endgame cast who are promoting the upcoming movie and trying really hard to say the wrong thing. Some are much better at it than others and Renner seems to be really good at it. Jimmy Kimmel Live! had Jeremy Renner on the show to promote Avengers: Endgame and the subject changed to the Hawkeye TV series. 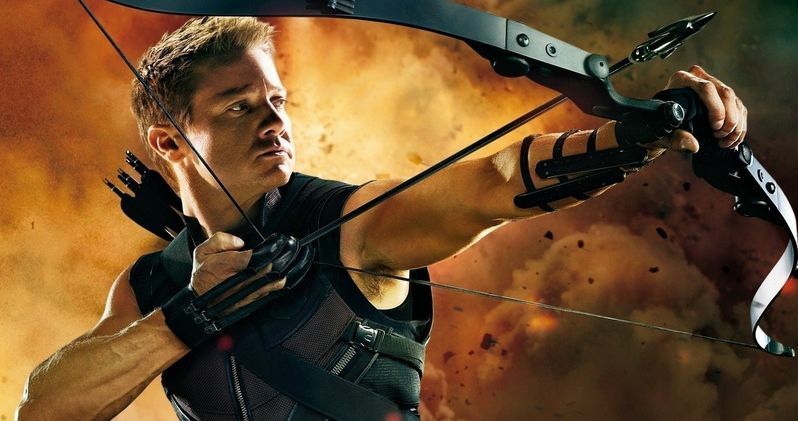 The new show will reportedly star Renner as Clint Barton as he passes the torch to Kate Bishop. Variety was the first to break the news and Renner admits they have a "variety" of stories when asked about the Hawkeye story. Jimmy Kimmel then says the news outlet is usually pretty reliable when it comes to reports like these and Renner agreed with him. The closest the actor came to confirming the show is when he said, it "could be" in development. As for not letting out any spoilers about Avengers: Endgame or the Hawkeye series, Jeremy Renner and Paul Rudd devised a plan to keep them both on track. Renner appeared on the Kimmel show last night with a shirt with Rudd's face on it because they were left out of Infinity War and then revealed how he's so good at keeping Endgame secrets. As it turns out, it all stems from a social media post he and Rudd made. Renner explains. "Paul and I decided during part of this press tour to make up a movie that we're in that we actually could talk about. So we're 50-year-old virgins and we can speak about that all you want." Jeremy Renner believes he and Paul Rudd came up with the 50-year old virgins movie idea on the set of Avengers: Endgame after they figured out how hard it was going to be to promote the movie. Now, people actually want to see their 50-year old virgin fake movie, including Renner himself and Jimmy Kimmel. The picture of the two actors promoting the fake project together is pretty funny and worth seeing. Avengers: Endgame is up next for Jeremy Renner and we could possibly see a Kate Bishop introduction in the movie. That is speculation at this point, but it could end up happening to help set up the Hawkeye TV series. Endgame hits theaters on April 26th, so the cast doesn't have too much longer to go for keeping all of the secrets. As for the TV series, it seems like it's really in development at this time. Hopefully more news drops soon. While we wait, you can see the fake promo for the 50-year old virgins below, thanks to Jeremy Renner's Instagram account, along with the whole interview.